BOGOTÁ, Nov 30 2007 (IPS) - Use of the sacred coca leaf, respect for water and nature, and other practices of the pre-Columbian Chibcha or Muisca culture survive in Colombia in spite of five centuries under attack. The culture was as highly-developed as those of the better-known Inca, Maya and Aztec people, according to scholars. Children learning the Chibcha language. Credit: Gloria Helena Rey. “Many Chibcha traditions and customs were demonised by the Spanish and other people, so we were encouraged to forget them,” writer Antonio Cruz Cárdenas told IPS. “However, Chibcha culture has not disappeared. We have begun to prove that it was not we who were the ignorant ones,” indigenous physicist and biologist Alfonso Fonseca, head of the Chibcha town council of Cota, half an hour north of Bogotá by road, commented to IPS. Like the Maya and Aztecs of Mexico, the Incas of Peru and the Aymaras in Bolivia, the Muisca at the time of the discovery had developed beyond primitive civilisation, and were ruled by chieftains, says the book “Culturas indígenas colombianas” (Indigenous Cultures of Colombia) by Rafael Martín and José Puentes. The Muisca had the most advanced pre-Columbian civilisation, according to scholar Miguel Triana in his book “La civilización chibcha” (The Chibcha Civilisation) in 1921. Today Chibcha ways survive in the central departments (provinces) of Cundinamarca, of which Bogotá is the capital, and Boyacá, where they have flourished since at least the 7th century BC. 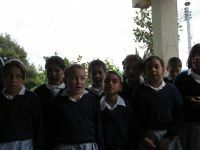 In Cota, IPS visited “Jizcamox”, the only public school in Colombia where Muisca is taught. It is a language older than Aramaic, according to researcher Mariana Escribano. A peaceful, organised, farming people, the Muisca spoke a language related to the Chibcha family of languages which originated in Central America. That language spread and split into several variants in Honduras, Nicaragua, Costa Rica, Panama, and certain regions of Colombia, Venezuela and Ecuador, according to Teresa Arango’s “Precolombia: Introducción al estudio del indígena colombiano” (Introduction to the Study of Colombian Indigenous People). Nowadays few Colombians speak Muisca, because speaking indigenous languages was forbidden in 1770 by royal decree, and Spanish became the dominant language, for social, religious, economic and political reasons. At Jizcamox, which means “healing with the hands,” Muisca is taught to 150 children with surnames like Tibaquichá, Boarejo, Balsero or Fiquitiva, who are direct descendants of the Muisca. “The children receive the usual primary education, but the language and traditions of their ancestors are emphasised,” María Yolanda Esquivel, the head teacher, told IPS. The pupils chorus their greetings of “chisué” (good day) and “anaxié” (see you later). In Cundinamarca and Boyacá, Muisca traditional customs are still practised. Grandfather Fernando, for example, leads the ancient rite of spiritual cleansing, which takes place at night when managing the energies is easier, as “silence with its cold murmurs is in constant dialogue with the Knower,” said Ana Tiquidimas, who attended one of these rituals in 2005. Chibcha words are still used in Bogotá, too, such as “curaba” (a fruit), “toche” (a bird), “guadua” (a bamboo-like plant) and “tatacoa” (a snake), although many people are unaware of their origin. Some residents of Bogotá think “ají” and “ajiaco”, the names of two traditional local dishes, are Chibcha words, but according to researchers they are of Carib origin. In modern shopping centres in Bogotá one can buy products made from coca leaf, which was used for centuries by the Muisca and other indigenous cultures for rituals and healing. Coca wine to cure depression, biscuits against fatigue or to suppress appetite, energising teas and creams to dull arthritic pain are all available. A pain-relieving, anti-inflammatory lotion, Cocadol, a revitalising, rehydrating drink called Coca Sek, and floral remedies useful against alcohol, tobacco and cocaine addictions are also manufactured and marketed on the basis of the coca leaf. “The coca plant cures practically anything. Indigenous people knew this centuries before the pharmaceutical laboratories,” anthropologist Héctor Bernal told IPS. His shop, “Coca indígena” (Indigenous Coca), is the first in Colombia to specialise in naturally manufactured indigenous products, particularly those based on coca and marijuana. Until the mid-20th century, coca leaves were sold in pharmacies in Bogotá and other cities, and mothers used them to get their children to sleep more calmly. “They gave me coca leaf tea in my feeding bottle as a baby. Coca didn’t use to have the negative cultural connotations it has now,” said anthropologist Patricia Clavijo, 55. The Chibcha cultivated and used coca centuries before drug trafficking existed. They also respected and protected their natural surroundings long before there were environmentalists, and practised natural medicine centuries before it was rediscovered in the 20th century. Their violent subjection to the colonial regime gradually destroyed their economic, social, political and cultural organisation, which led to a demographic catastrophe among their people in the mid-17th century, says researcher Luis Eduardo Wiesner in his book “Etnografía muisca” (Muisca Ethnography). “The Spaniards understood nothing about this civilisation, and as the Chibcha were not warriors, they perished as victims of the conquerors’ violence,” said Cruz Cárdenas. Direct descendants of the Chibcha live today in Bogotá and nearby towns such as Cota, Chía, Tenjo, Sesquilé, Suba, Engativá, Tocancipá, Gachancipá and Ubaté. Two Chibcha settlements are located in Cota and Suba. Chía means “moon”, and Cota is derived from the Chibcha verb “cotansuca”, which means “to lift up or uprise, to become furious”, according to the chapter on the Central Andean Region in “Geografía Humana de Colombia” (Human Geography of Colombia). Trade continues to be one of the main activities of Muisca descendants, as it was for their forefathers. Maize, potatoes, cassava and beans are their staple diet. They continue to trade in salt, charcoal and textiles, and make handicrafts that are richly decorated with animal and human figures and fantastical creatures. In the rural areas and cities of Cundinamarca and Boyacá, traditional Muisca cultivation methods continue to be used, guided by rainfall cycles and the phases of the moon. Muisca farmers say they have no need of weather forecasts. The song of the blackbird announces rain, while “the song and flight of the plumed ‘copetón’ is a signal that the rain is about to stop,” Arturo Muscué from Chía, a 20-minute drive north of Bogotá, told IPS. “When the potato and pea plants close their leaves and point upwards, it’s also a sign of coming rain,” he said. A wide variety of lucky charms and talismans are used, such as river pebbles or a pulpy aloe leaf, to ward off bad luck. Like their ancestors, the Muisca descendants respect the lakes, mountains and rocks. They see the “spirits” as associated with physical phenomena, like rivers, mountains and lagoons, according to “Mitos y leyendas populares de Boyacá” (Popular Myths and Legends of Boyacá). Some rural people in Boyacá believe that the water spirits not only travel under the earth, but also take human shape and walk, the book says. Historians state that these surviving myths go back to deep Chibcha roots and are related to myths like those of Bachué, Bochica and Huitaca. Bachué was the mother of the Muisca people. She emerged from the Iguaque lagoon (an hour’s drive east of Bogotá), married her son, peopled the earth and returned to the lagoon as a serpent, along with her son. Bochica was the civilising god, and Huitaca the rebel goddess. “That’s why the Chibcha worshipped water, and their adoration was transmitted through the myth to the small farmers of Cundinamarca and Boyacá,” said Cruz Cárdenas. The Chibcha lived in the central region of Colombia. When the Spanish conquest began in the 16th century, they were organised in a confederation of chiefdoms, according to Human Geography of Colombia. “The Muisca chiefdom of Bogotá, presided over by the Zipa (the great chieftain), was the most important of the five chiefdoms,” said Cruz Cárdenas. Muisca territory included Andean valleys, plateaus and slopes with different temperatures, humidity and rainfall, mainly depending on altitude, says historian Álvaro Botiva in “Colombia prehispánica” (Pre-Hispanic Colombia). Spanish philosopher José Ortega y Gasset (1883-1955) was not mistaken when he said that human beings are not like tigers. Every tiger is the first tiger, and has to start his life as a tiger from the very beginning, he wrote. But human beings are heirs to all the ways of existence, ideas and life experiences of their ancestors, and start life therefore with the whole accumulated human past beneath the soles of their feet, he wrote in “El libro de las misiones” (The Book of Missions). The more than eight million people in Bogotá and other towns who live in the ancestral territories of the Chibcha did not start life like the tiger. When they were born, the accumulated human history beneath the soles of their feet was already thousands of years old. That statement is meaningless. All languages are as old is each other inasmuch as they’re all descended from older varieties. I am looking for the address to this school. Does anyone have any information? “I got native older then Jesus” (savage fam, strychnine rap song)…Nice idiom..Check it out…. COLOMBIA: The Chibcha Culture – Forgotten, But Still Alive, please let me know where Chibcha is being taught? Can I use any email to contact you?